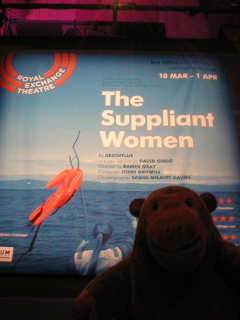 Mr Monkey caught a bus into Manchester, then scampered along to the Royal Exchange Theatre for the press night of The Suppliant Women. The Suppliant Women is the first of Aeschylus' trilogy of plays about the myth of the Danaids; it's also the only one of the trilogy to survive intact to the present day. The play was probably first performed some time around 470BCE and is the first known play to refer to democracy by name. A ship carrying Danaos and his fifty daughters arrives on the coast of Argos. They are fleeing from Danaos' brother Aegyptos, who wants to marry his fifty sons to Danaos' daughters regardless of the wishes of any of them. All of them are the descendants of Io, a woman from Argos, and Zeus, top god in the Greek pantheon, and Danaos and his daughters claim Zeus' protection. King Pelasgus of Argos meets the suppliants and, after they've stated their case, explains that Argos is a democracy (this is the oldest known play to mention democracy by name) and it's up to the people of the city to decide whether the suppliants are given shelter or not. The citizens of Argos vote unaminously to protect them, and persuade a small raiding party from Aegyptos' fleet to leave the women alone. The play ends with the Danaids finding out that the citizens of Argos now expect them to marry Argives, because Argos is dedicated to Aphrodite. The two missing plays apparently dealt with the Argives being defeated by Aegyptos, with the Danaids being forced to marry their cousins and all but one killing their husbands on the wedding night. The set for this production is an empty octagon of pale stone blocks; there is no room for scenery as such because the chorus is on stage throughout the play. The chanting of the chorus is accompanied perfectly and dramatically by live music in a variety of styles, not all authentically ancient Grecian but all fitting the emotion of the moment. Mr Monkey was interested when he found out that one of the musicians was playing an aulos, the ancient double-reeded double-pipe, and he was a little disappointed that he couldn't see the instrument from where he was sitting. There are only four individual parts in The Suppliant Women, shared between three actors. Oscar Batterham plays King Pelasgus well as a rather oily politician; Obar Ebrahim is excellent as Danaos and horribly effective as the Egyptian Herald; and Gemma May as the Chorus leader is the only one of the suppliant women to have a separate voice of her own. 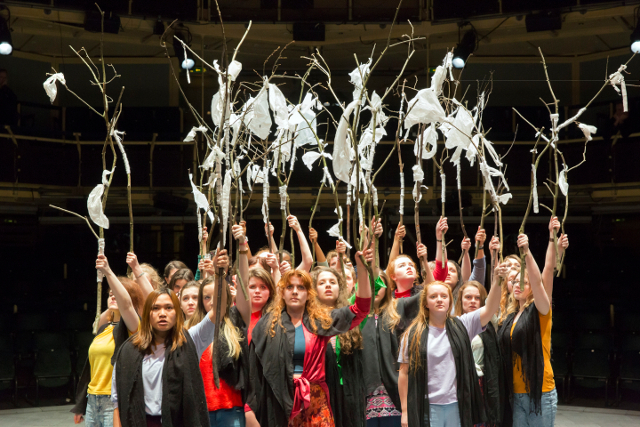 What made this play so brilliant for Mr Monkey was the chorus of suppliant women. These are all volunteers aged from 16 to 26 who fill the stage with a sort of organised chaos off movement and chanting. It took Mr Monkey a minute or two to get used to the chanting style, which sounds as if it should be repeating lines but doesn't, but he caught on quickly. The suppliant women chorus are on stage pretty much all the time, and their colourfulness and energy (and ability not to run into each other) made the play for Mr Monkey. Mr Monkey thoroughly enjoyed The Suppliant Women and recommends it to anyone with the slightest interest in seeing a 2500ish year old play that raises issued in the news today. The Suppliant Women runs until 1st April 2107.